In 1920s Pelican River, eccentric science fiction novelist Ruth Black receives a visit from her aunt Julia, who brings with her a prediction that Ruth is in danger. Julia's visions are making her ill, and while the doctors say it is epilepsy, Ruth knows that the thing that is coming for her is not of this world. When threatening letters begin to arrive, claiming to know of a horrible secret involving Ruth's deceased husband and father, she decides to take matters into her own hands, and with the help of her friend Gordon, she sets out to solve the case herself. KA Bedford is a two time Aurealis Award winner for excellence in science fiction writing. This new novel is something a little bit different for the contemporary fiction scene; it is a book which is part 1920s detective novel and part foray into the supernatural realm. Think Phryne Fisher with demons. The writing style is evocative of an old time detective novel, told in an educated, very English first person voice. Ruth, as narrator, is sharp-witted and observant, if not slightly cynical. The cast of characters alongside her were a real strength of the novel, and I really enjoyed the book because of them, first and foremost. For the uninitiated science fiction reader, Black Light is at first a gentle introduction, gathering weirdness as it gathers steam, until, in its explosive final chapters, Ruth Black leaves the realm of the normal (literally) and embarks on a futuristic chase through the next world, looking for her would-be blackmailer. These segments, while well-written, were a departure from the rest of the novel, which managed to maintain a 1920s atmosphere which was most satisfying. The final section of the novel would have found itself at home in a Max Barry novel, and was a little disorienting at first, although not so much as to cause the ending to be unsatisfactory. Anything but. I would have appreciated a little more explanation as to the relevance of the elves, however, as they seemed to come out of nowhere and serve no real purpose, other than to signify that something weird could happen. Time travel has become a bit of a trademark of Bedford's work, one of his previous works being the humorously titled, Time Machines Repaired While-U-Wait, which I admit I have not read but I would now, having been introduced to this darkly-comic and clever writer. It features in an amusing way in this novel, but thankfully does not serve as a deus ex machina to the book's resolution. 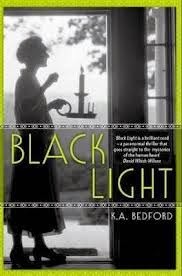 (How Bedford DOES resolve his mystery I will leave for the reader to discover themselves.) As far as a crime novel goes, it was more Agatha Christie than Michael Robotham, although there's nothing wrong with that. The degree of difficulty in solving the crime was not high, but then again that was never the point, was it? I would definitely read more supernatural crime stories featuring Ruth and Gordon. I gave this novel three stars.